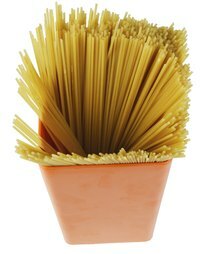 Simple to make and easy on the wallet, spaghetti is a popular choice for large group dinners. From family celebrations to school fundraisers, spaghetti dinners are in demand. Decorations for spaghetti dinners can be as simple or elaborate as you like. From creating an atmosphere reminiscent of an Italian café to letting children design the decor, the possibilities are plentiful. Use the talents of the school children when decorating for a school-sponsored spaghetti dinner. Young children can add handprints to paper table runners or vases that will serve as centerpieces, or they can trace their hands and cut out handprints to assemble wreaths, handprint trees or coasters. Older children might paint a mural or make a splatter painting for wall decorations. They could also look up fun facts about spaghetti and print them on small cards to place on tables for conversation starters. Each class could offer a photograph or photo collage to serve as centerpieces. Create a little Italy with decorations that reflect an Italian café. To best achieve this look keep decorations simple and select warm, neutral colors such as white or cream tablecloths and plain dinnerware. Place an easel chalkboard sign at the entry with the evening's menu or wine selection listed. Hang white twinkle lights throughout the dining area with fresh flowers or candles placed around randomly. For centerpieces, place a tapered candle in the top of a wine bottle and let the wax drips cover the bottle. Hire a violinist to play favorite Italian music. When the spaghetti dinner is part of a seasonal celebration or special event, incorporate these elements into the decorations. For a fall dinner dress the tables in autumn colors such as yellow, orange and red. Spray dried spaghetti noodles orange and brown, bunch them together, tie with a raffia ribbon and set in the center of the table. Scatter colored artificial leaves on the table to create a natural look. Use straw bales, pumpkins and colorful mums for more fall splendor. Make it a traditional American-Italian-themed affair. Decorate with the colors of the Italian flag – green, white and red. Cover the tables with these colors or use a traditional red-and-white checkered cloth. Miniature Italian flags, tabletop chalkboard easels or small travel posters featuring Rome, Florence or Venice could serve as centerpieces. Other decorations might include clear jars filled with a variety of pastas or dried noodles dyed to match the color scheme, baskets filled with purple grapes and bread, or reproductions of art by Italian artists. Play Italian music quietly in the background.